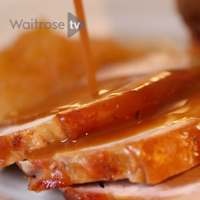 This recipe shows you how to make gravy using the pan juices from a joint of roasted meat – this works with any meat including lamb, chicken, beef or pork. Once you’ve cooked your meat, remove from the roasting tin and leave to rest. Pour the jar of stock into a jug and make up to 500ml with cold water, or the cooking water from your vegetables. Transfer to a saucepan and heat gently. Tip the roasting tin slightly and spoon out all but 2 tablespoons of the fat into a dish lined with kitchen paper. When cooled, discard. Scrape up all the juices and caramelised bits from the bottom of the roasting tin with a wooden spoon, then place the tin over a low heat. Heat the fat and juices until they begin to bubble, then add the flour and mix to a thick paste using a wooden spoon. Cook for 1-2 minutes, stirring constantly. Remove from the heat and add the stock gradually, stirring all the time, blending so the mixture is smooth. Return to the heat and bring to the boil, stirring all the time. Continue to cook until the gravy is thickened, rich and glossy. You can also pour in any juices that have come out of the meat while it has been resting.